It’s officially wedding season, which means that many of us have bachelorette parties lined up all summer long. I’ve been to a handful of bachelorettes through the years, so I thought I’d put together my list of do’s and don’ts when it comes to celebrating your bride-to-be bestie. The absolute, most important rule of etiquette when it comes to bachelorette parties is this: You are celebrating a very special bride-to-be, and this weekend is all about her. I’ve been to a handful of bachelorettes where some of the bridesmaids and guests lose sight of this, and make the festivities about them and what they want to do. Now, I know that everyone is paying their own way (and in many cases for the bride, too), so it can be tough to put that aside and focus on what the bride-to-be wants to do. But trust me—if you want to have a happy bride-to-be, keep the weekend about her. It’s traditional bachelorette party etiquette to cover costs for the bride-to-be. This one can vary from bachelorette to bachelorette, but in most cases, the guests will pay for meals, cocktails and special celebrations for the soon to be bride. My advice? When you know that you have a bachelorette coming up, try to save a little extra each month so that you can spoil the bride-to-be on her special weekend. A note on gifts: In my experience, it is not necessary to bring a gift to the bachelorette party. You’re paying for your transportation, hotels, meals, and most likely will be covering costs for the bachelorette—that is quite a lovely gift, if you ask me! You’ll want to be extra careful when Instagramming over a bachelorette weekend. Bachelorettes can get a bit wild (depending on who you’re with and who you’re celebrating), and some of the photos you take should never see the light of day. Just make sure to get approval from the rest of the bach’ party before you post/tweet/etc. And if you need a refresher on the topic, take a peek at our blog on social media etiquette. Determining what to wear to a bachelorette party will have a lot to do with where you’re going, what the plans are and what the weather will be like. However, there are a couple rules to follow no matter where you’re going. First, it’s customary for the bride-to-be to wear white, so unless you’re the bachelorette being celebrated, leave your white-on-white ensembles at home. Next, I recommend keeping it ladylike when it comes to your outfits. While it can be tempting to wear that too-short dress for a night out in Vegas, think twice before you head out in an outfit that you’ll regret the next day. The worst feeling in the world is waking up the next morning either not remembering what happened the night before, or dealing with a hangover that means you have to miss the day’s celebrations. It’s definitely fun to have a few cocktails with your best girlfriends and celebrate one of the most exciting times in a friend’s life, but trust me, you’ll want to be able to soak up every minute with your friends instead of being stuck in bed with a hangover headache. Now, keep in mind. If you’re going to Vegas, the vibe will be very different than if you’re heading to Palm Springs for a spa weekend. You’ll want to make sure that you plan (and pack) accordingly, based on where the festivities are located and what’s on the agenda. You’ll also want to refer to our proper party girl etiquette as well as our wedding guest etiquette post. Most of those rules also apply to bachelorette parties. 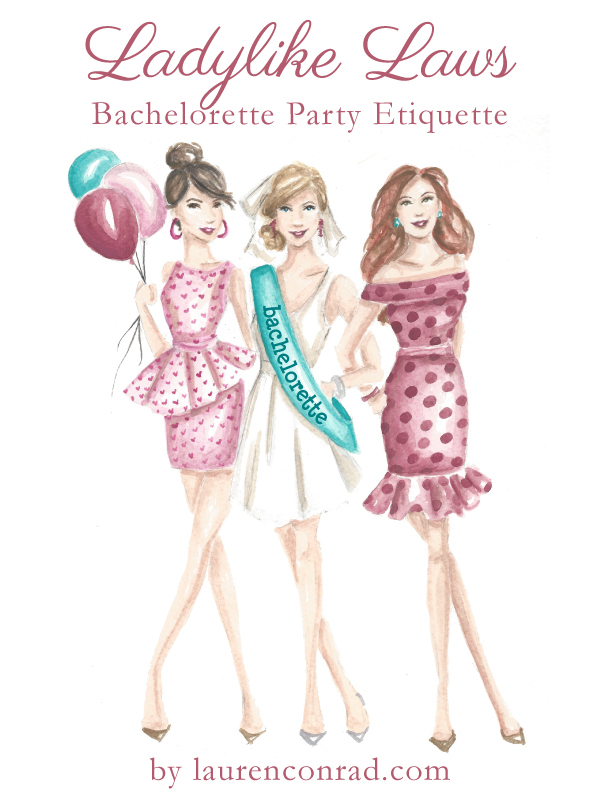 Do you have any other bachelorette party etiquette tips?